or with Beurre blanc Morton Bay Bugs. RIESLING has dropped off the twig as a wine of preference for many these days, which truly is a shame because it can be a delightful choice with dishes ranging from spicy Asian and Mexican, to salty shellfish. And if there's a region that's a great producer of Australian Rieslings, its South Australia's Clare Valley whose rich soils, warm days and cool nights are a perfect start for some of our most intensely-flavoured of these wines. Leasingham have long produced Rieslings of outstanding flavour from the Clare, their Bin range achieving something of icon status. The recently-released 2010 Bin 7 shows just why the Clare and its sub-region of Watervale have earned a reputation as one of our premium regions for the varietal. This is a wine that's got loads of Riesling lemon and lime characters, great minerality and a touch of spice. At $23 you'll find it a good match with spicy Asian and Mexican foods, yet at the same time it can be just as delightful with shellfish such as Morton Bay Bugs in a lemon and lime Beurre blanc. for ten years to develop its full potential. ONE FOR LUNCH: ANOTHER Clare Valley maker, Tim Adams and wife Pam Goldsack have been making wines in the Valley under their own label for a quarter century, and while producing a range of wonderful varietals and blends it is their Tim Adams Shiraz that's one of their great mainstays. Erina master distiller Philip Moore does it again winning another major award, this time at the 2010 San Francisco World Spirits Competition (SFWSC). The locally distilled Skillion Blue Vodka has snatched silver at the prestigious 2010 San Francisco World Spirits Competition (SFWSC). The Skillion Blue Vodka keeps good company with 42 Below, Skyy and Finlandia Vodkas also receiving silver. The SFWSC is one of the premier international spirit shows attracting worldwide entries from major and artisan distilleries. Skillion Blue Vodka has a smooth rich mouthfeel, and an enjoyable sweet grain aftertaste. Philip Moore, owner and distiller at St Fiacre Distillery, handcrafts his spirits and liqueurs in a mix of traditional and state of the art stills right here on the Central Coast. "The secret of my vodka's smoothness is that it's been made in a Holstein Still specially imported from Germany. The Holstein Still is highly evolved to create a much finer and more pure flavour. There are only a handful of these stills in Australia and this one was custom made for me" said Moore.
" My goal was to make a vodka that was so pure and smooth that it could be mixed in any cocktail and not spoil the drink with a harsh intrusive flavour. At the same time by handcrafting the vodka I have given it a truly distinctive flavour that distinguishes it from the industrial vodkas with their neutral flavour. This makes it a winner in a vodka martini!" Moore claims. Skillion Blue Vodka is available at St Fiacre Distillery, 25 Portsmouth Road, Erina, just off Terrigal Drive. Tours of the distillery, tastings and sales are offered from Wednesday – Sunday 10.00AM - 5.00PM. CANBERRA'S Shaw Vineyard Estate's Winemakers Selection may be its cheapest label at just $16 a bottle, but it certainly comes up trumps when it comes to value for money. 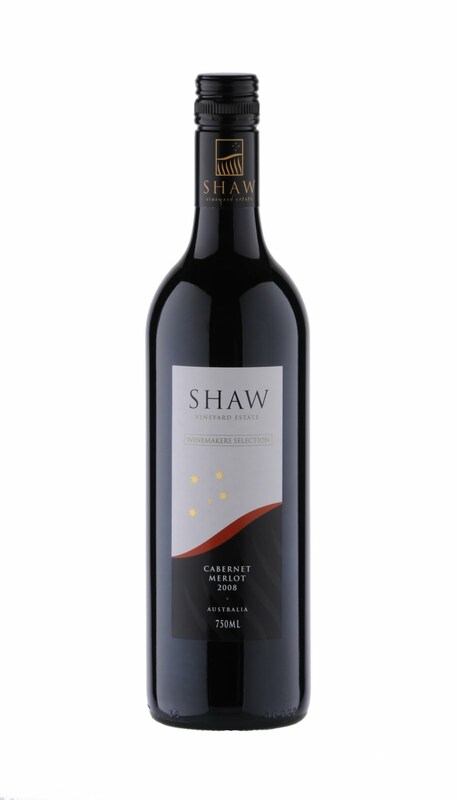 The just-released 2008 Winemakers Selection Cabernet Merlot is particularly interesting because Graeme Shaw excels when it comes to Cabernet – in fact he believes it's the best fruit in his cool-climate vineyard – and this Cabernet Merlot blend was made in a year in which those Cabernets really stood out. So good were they that Graeme produced his first-ever Reserve Cabernet under the Merriman Label, and then blended part of the remainder with Merlot to create his more-budget Winemakers Selection blend. It's a wine of dominant blackberry and spice flavours with balanced oak; certainly exceptional value at $16 from a great vintage to enjoy with saucy pastas, or if you prefer, to end the meal with strong cheeses. ONE FOR LUNCH: Western Australia's Capel Vale The Scholar label wines are made from grapes hand-chosen from only the best of select rows in the vineyard, and then blended in the company's best-available barrels to produce limited-quantity wines of outstanding quality. "They're the most labour-intensive and exquisite wines that we can produce, and only released in years that we think are worthy," says CEO, Simon Pratten. "In fact for our 2008 The Scholar Cabernet Sauvignon we made just 200 cases," he adds, and which doubtless explains the $75 price tag. But for a special occasion, this wine is a stand-out, full of mulberry and plum flavours and chocolate-like overtones. Enjoy it on that special occasion with Moroccan-style slow-simmered lamb shanks with garlic, cumin, coriander, harissa and dates, served with a side of couscous or mashed potatoes. And the hot tickets for this year's opening weekend are for the annual Whispering Brook Olive Long Table Luncheon (Saturday 4th June). Book a seat quickly to ensure you don't miss out on discovering more about food, wine and olives than ever before! It was the ancient Greeks who first labelled olive oil "liquid gold", but it is modern Australians who are embracing the many varieties of olives and producing exciting, superb quality olive oils. Like the high-quality wines also produced at Whispering Brook, owner/winemaker Susan Frazier knows that good olive oil can only be produced by using superior quality fruit ...but unlike many fine wines, ageing is not the key and instead, the fresher the better. Susan says, "2011 is set to be a great extra virgin olive oil year, after lower than anticipated olive oil yields in 2010. The team has been working exceptionally hard and completed harvest just last week, but there is no time to rest and we are now busily processing the olives so they will be ready just in time for the Olive Long Table Luncheon – the first time the public will get to try our new olive products at their freshest and best." At the heart of this exciting event is a spectacular four course meal, designed by Chef Carolyn Scott to uniquely highlight the quality and flexibility of the Australian olive (as well as perfectly complement the wines from Whispering Brook). The luncheon will be fittingly set amidst the picturesque olive groves at Whispering Brook and this year's menu includes a Redgate Farm slow cooked duck leg in merlot, green olives and dried Kulnura figs and an Italian chocolate & raspberry olive oil cake with local Udder Farm pure cream! The Olive Long Table Luncheon is not only a delicious wine and food experience but also a great way to delve further into the wonderful world of the olive and discover more about the qualities of Australian olive oils and the many culinary and health benefits of olives. The experience will start with a tutored walking tour of the estate's olive groves and vineyards so you can learn about the different varieties of olives. And after Carolyn has taken you through the menu and unravelled the secrets of matching food with different styles of olive oil, leading Australian olive expert Peter Olson will be on hand to expand your olive appreciation with a background into the production of olive oils and the art of oil tasting. 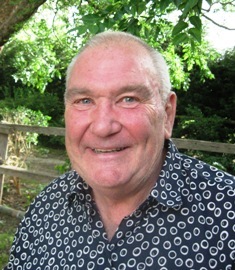 Peter is an olive oil judge at the Royal Sydney Fine Food Show and former head of NSW Industry & Investments Olive Oil Testing Service, so who better to disclose the true delights of our own "liquid gold". Whispering Brook was established in 2000 in Broke in the Lower Hunter Valley. Thanks to the high quality vines grown on the estate's combination of terra rossa soils (ideal for Shiraz and Merlot) and sandy loam soils (perfect for Semillon and Chardonnay), Whispering Brook produces some wonderful wines. The olive grove is planted to a combination of Italian and Greek olive varieties which yield both olive oil and table olives. Cellar door open every Saturday 11.00am to 5.00pm, Sunday 10.30am to 4.30pm. The estate also contains a guest house with accommodation for up to18 guests. A comprehensive guide to the Canberra wine district — its history, unique features, exceptional performance and the wineries themselves— will be 'uncorked' tomorrow, Friday 20 May 2011. Wines of the Canberra District: Coming of Age will be launched at the University House Wine Symposium by the Deputy Chief Minister and Minister for Tourism, Sport and Recreation, Andrew Barr. Written by local winemakers Brian Johnston and Janet Johnson, the book is a must-have for those keen to discover the Canberra wine district, as well as for people who want to know the secrets behind the region's success. Developed with the support of the Canberra District Wine Industry Association (CDWIA), the book is also an extensive reference source, profiling more than 40 wineries. "It's the essential guide for those wanting to find out where the wines are made and the people who make them," said Elke Davies, spokesperson for the CDWIA. "Each profile includes a background to the winery, their approach to production, awards received, as well as practical details such as cellar door sales. "This book will provide another positive tool to attract and educate Canberrans about the amazing local wine region that many residents have sitting just over their own back fence. "We know that it will also play a part in motivating more tourists to include a trip out to the wineries on their next visit to Canberra," she continued. From the unique continental climate to its strong science-based approach, the book explores the key reasons why Canberra District wines are now well and truly on the national wine map. Wines of the Canberra District: Coming of Age will be available for purchase at the University House Wine Symposium this Friday, as well as at a range of quality local bookstores, cellar doors and Canberra attractions. RRP: $33.00. The book can also be purchased online at www.mckellarridgewines.com.au. The results of the international Syrah du Monde Awards were released this week, with Australia’s very own Cumulus Shiraz 2008 collecting a gold medal (one of only 34 awarded) and an impressive position in the competition’s Top 10 syrah/shiraz from around the world. The Syrah du Monde 2011 brought together nearly 400 wines from 24 countries, making this competition one of the world’s top events for syrah and shiraz wines. The Top 10 ranking had a strong international diversity this year with six countries appearing among the world’s ten best syrah/shiraz wines. With 3 wines from France, 2 from South Africa and 1 each from Switzerland, Italy and Bulgaria, that left two spots for Australian wines – one from the Barossa and the Cumulus Shiraz from Orange NSW. Winemaker Debbie Lauritz says “I’m obviously thrilled that it was our wine that was selected by this highly experienced panel of judges but I’m also just really happy to see Orange included alongside the most famous shiraz wine growing regions in the world. As wine growers, we fiercely believe in the quality of the Orange wine region and our vineyards. The Cumulus vineyard was established in the early 1990’s and rises to 620 metres, making it high-elevation and cool-climate. The fully mature vines are deeply planted on ancient soils some 450 million years old. 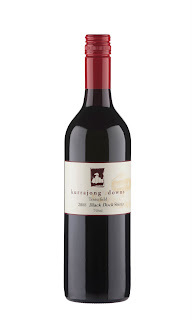 The limestone base is overlaid by volcanic-derived basalt from the now dormant Mount Canobolas and this ancient combination of well-drained soils produces vines of unique fruit strength and character. Cumulus also prides itself on their sustainable approach in the vineyard, ensuring they avoid any unnatural and toxic substances with the long-term view of producing healthy, balanced vines with minimal intervention. The Cumulus Shiraz (and its sister wine the Cumulus Chardonnay) is sourced from the estates best vineyard blocks and only made in small lots in exceptional years when the quality is deemed high enough. The Wirra Wirra tribe is packing up its wine, printing the tasting notes and departing picturesque McLaren Vale to head on a road trip for its much anticipated Bell Ringer Dinners 2011, which will take in Adelaide, Melbourne, Sydney, Brisbane and for the first time they are heading west to Perth. Bell Ringer Dinners only come around every couple of years and are a chance for people to enjoy wonderful food and drink at some of Australia's premier restaurants. This year's dinners will feature Wirra Wirra new release wines, including the 2009 The Angelus Cabernet Sauvignon, and a couple of old wines from the depths of the Wirra Wirra museum. Wirra Wirra Managing Director Andrew Kay will be leading the convoy with Senior Winemaker Paul Smith to each city ready to take the Bell Ringers through each wine and to have a lot of fun too. "It would be great to see as many of our Bell Ringer members but also anyone who is interested in having a night filled with great food and wine, with like-minded wine and food lovers," Kay said. The Bell Ringers are named after the famous Angelus bell that sits atop the ironstone cellars of Wirra Wirra at McLaren Vale. For bookings please contact Lisa McNicol at Wirra Wirra on (08) 8323 8414 or lmcnicol@wirra.com.au. Groups and corporate bookings are welcome. Bored of the same wine club wine offers, containing old, unwanted stock and selected by an unknown-face in a warehouse? Wouldn’t it be great to have your own guest sommelier from an award-winning restaurant to help you select wines for your cellar or to really impress at your next dinner party? Please welcome Bullion Cellars to Australia. Bullion Cellars is about helping its members discover hard-to-find premium wines at the right price, chosen by experts and conveniently delivered to their door. To achieve this goal, they have asked the top sommeliers in the country to select premium wines for their members. People whose job and passion it is to taste the best wines from around the world every day and refine them to the chosen few for their world-class wine lists. Exactly the type of wines Bullion members want to discover. Each quarter a different sommelier will select the Bullion Dozen, ensuring members get a great cross section of wines. Bullion Cellars was started by Matthew Eagan and Stuart Freeman; two friends from very different backgrounds. Matthew comes from 15 years experience in the wine industry and Stuart from 16 years working in the highly competitive recruitment industry. It is because of these different backgrounds, that they have been able to take this unique approach to the sale of premium wines and not just follow the traditional model. Matthew Eagan says, “We did not want to be just another on line retailer, offering our members the latest clean skins or failed export orders. We are extremely excited by these wines, and they are definitely the sort of wines you would want to bring out for your next dinner party or special occasion. · Each quarter Bullion Cellars will deliver a premium dozen, made up of world-class wines from Australia and the rest of the world, chosen by leading sommeliers from our country’s finest restaurants. · You will get 3 bottle of each wine, so you’ll have no problems entertaining a large group, or trying a wine in different circumstances to see whether it is influenced by food or the length of time in your cellar. · You will only be offered regional and varietal heroes - wines that are regarded as best in class, but also with the ability to grow into something special when laid down for a year or two. · Because Bullion Cellars has access to exclusive distribution networks, they can offer wines that usually only appear on restaurant wine lists. … enjoy with fresh oysters, or a platter of cheeses. His enthusiasm paid off virtually from the start, and today his Single Vineyard premium series under the Mount Barker Whispering Hill and Margaret River The Scholar labels are highly-awarded gems of what he aspired to create. "My father has always been inspired by the great wines of France, wines of elegance and typicity," says Peter's son, and now company CEO, Simon Pratten. "So it makes sense that our latest releases – the 2008 Mount Barker Whispering Hill Shiraz, 2008 Margaret River The Scholar Cabernet Sauvignon and 2010 Mount Barker Whispering Hill Riesling – would be influenced by our approach to handling these old world classics." We were particularly impressed with the 2010 Whispering Hill Riesling, a wonderful cool climate wine that's made only in select years from the very best fruit from the most select rows in the vines: the palate of this gem is alive with lime-citrus flavours, coupled with great flint and mineral characters. Pay $35 and start a grand dinner with this and fresh oysters, or finish-off with a glass or two with some soft goat's and hard cow's cheeses. ONE FOR LUNCH: HALF-WAY between Sydney and Brisbane is the New England wine region, an inland area of 42 vineyards and five wineries that was first planted in the 1880s, but it only now coming to recognition – particularly as Australia's only region to boast both warm and cool viticulture. One label worthy of an investment in is Kurrajong Downs Black Duck Shiraz: the red berry flavours are influenced by spice and peppery characters making an ideal match with sweet and spicy pork spareribs. Great buying at $21. and a black butter sauce. 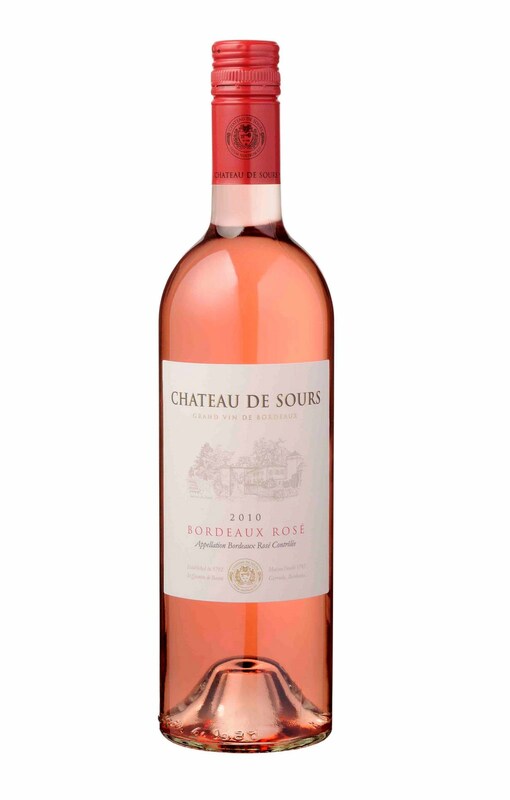 IT'S been described as "one of the best Rosés in the world," yet its priced at just $28 a bottle and comes from a chateau in France's Bordeaux region that began life in the 14th century as a humble inn for passing pilgrims. Chateau de Sours is now owned by Martin Krajewski, who became financially involved with the company in 1997, loved it so much he joined the board in 2003, and in 2004 gave up his London job in executive search to buy the grand old Chateau – and spend years restoring it to its former glory. 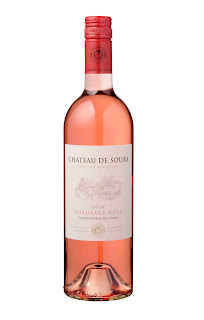 Today the company produces wines under four different brands, with the Chateau de Sours label Rosé one of the most popular, selling in twenty-two countries including Australia. The latest-release 2010 is predominantly Merlot-based with a touch of Cabernet Franc, resulting in wonderful flavours of red summer-fruits, suggestions of strawberries and cream and a nicely balanced acidity. A lovely wine to enjoy with lobster and a black butter sauce made with butter, parsley, capers and a squeeze of lemon. ONE FOR LUNCH: McWILLIAM's Mount Pleasant Elizabeth Semillon is a virtual household name when it comes to value and quality, and while its just $17.99 (for the just-released 2010) go a few dollars more and pay $22.99 for the 2005 Mount Pleasant Cellar Aged Elizabeth Semillon that's also now available. Although still quite youthful and with probably five years or so to develop further complexity, its most enjoyable now with beautiful lemongrass, lime and lemon on the palate, coupled with hints of honey. With those lemongrass flavours it's a great wine with chargrilled swordfish served with a lemongrass, mint and peanut salsa, and also matches ideally with Thai fishcakes. 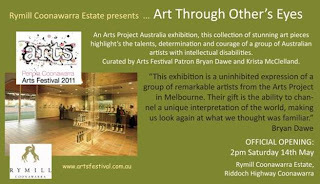 An Arts Project Australia exhibition, this collection of stunning art pieces highlight's the talents, determination and courage of a group of Australian artists with intellectual disabilities. 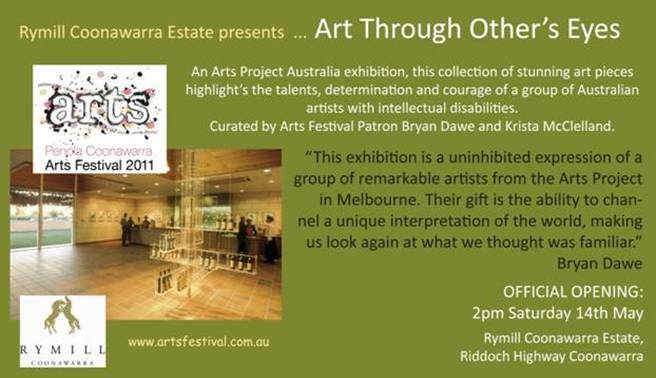 Curated by Arts Festival Patron Bryan Dawe and Krista McClelland. Join Rymill for the official opening of the exhibition, where guests can enjoy a complimentary glass of Rymill Coonawarra Sparkling and cheese platters, whilst taking in the art. A must-attend event for any wine and art lover! During the exhibition Rymill Coonawarra will be raffling a magnum of Rymill 2000 Cabernet Sauvignon, with proceeds going to the Penola Coonawarra Arts Festival's 21st Anniversary in 2012. The Mudgee Region is a 3.5 hour drive from Sydney in Central NSW, has more than 150 years of winemaking history and is the third largest grape-growing region in NSW with around 40 cellar doors. It produces excellent Cabernet Sauvignon and Shiraz, is the modern home of Australia’s first Chardonnay plantings, as well as Italian varietals Sangiovese and Barbera, which thrive in the Mediterranean climate. Major cellar doors include Robert Oatley Vineyards, Robert Stein, Logan Wines, Lowe Wine, Huntington, Farmer’s Daughter Wines and Bunnamagoo Estate, or try Organic at Botobolar and Broombee, or go boutique at Burrundulla Vineyards, Frog Rock and Skimstone Vineyard. 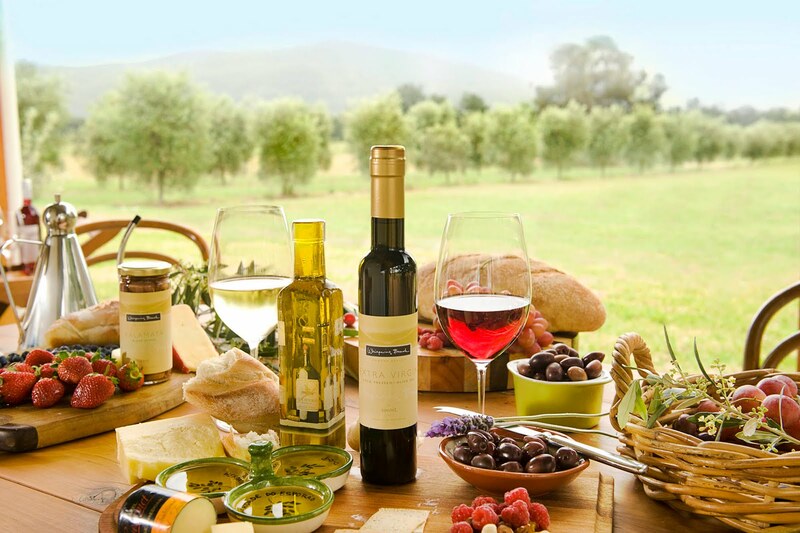 A food and wine lover’s paradise, Mudgee is famed for produce such as sweet honey, freshly pressed olive oil and olives, farmhouse cheeses and nuts. Tie in your visit with one of many events that fill the calendar year such as the monthly farmers markets or unique winery celebrations. The Mudgee Region offers visitors a range of other sensory experiences that are perfect after a day at the vineyards. The region is rich with accessible nature, wildlife and birds, art, craft and ceramics, heritage museums and historical villages, antique and gift stores. Or simply retire to a huge choice of accommodation in boutique hotels, B&Bs or self-contained cottages with a roaring fire. To find out more and plan your visit go to www.visitmudgeeregion.com.au or call (02) 6372 1020. The Pyrmont Ultimo Chamber of Commerce (PUCC) and Mudgee Wine Grape Growers Association (MWGGA) are delighted to announce the full program of activities for the Pyrmont Festival of Food, Wine and Art, 3 - 15 May. The festival - in partnership with Mudgee Region - is a celebration of the best food, wine and creative talent from both the Pyrmont and Mudgee Region. The 12 day program will see 'Pyrmont Uncork Mudgee' with a series of wine and food matched lunches and dinners at 13 of Pyrmont's premier restaurants including the award winning Signorelli Gastronomia and Blue Eye Dragon, as well as Sydney's fine dining seafood restaurant - Flying Fish. The future stars of Australia's culinary industry will also be serving up a feast at TAFE's The Apprentice. Saving the best until last, the grand finale will be a one day sensory extravaganza on Sunday 15th at Pyrmont's award-winning Pirrama Park, on the waterfront. Visitors are invited to come and sample over 120 different wines from 30 Mudgee winemakers. To complete the taste-sensation, gourmet foods and unique cuisine from across Pyrmont and the Mudgee Region will be available for tasting. In the centre of the park, the 5th annual Pyrmont Art Prize will have over 300 pieces of bespoke art on sale from a range of budding and professional artists from metropolitan Sydney and the Mudgee area. All art pieces submitted for the Pyrmont Art Prize are featured on identical, 12-inch squared canvasses, creating a quilt of diverse colours and subjects in a range of media from paintings to photographs to mounted reliefs. The works will be judged by an expert panel with over $10,000 worth of prizes up for grabs. Throughout the day there will be roving entertainers and a performance stage, hosted by ABC Sunday Today presenter Whitney Fitzsimmons. Pyrmont Art Prize with an acknowledgement of Pyrmont's burgeoning dining precinct and our partnership and synergies with Mudgee Region to create an all-encompassing celebration: Pyrmont Festival." certified organic grower at Botobolar; the award-winning Thistle Hill; and five organic wineries. Visitors to Pyrmont Festival will enjoy a diverse range of quality wines the Mudgee Region has to offer, from organic to Italian varietals and our renowned big, bold reds." "Pyrmont skirts the harbour, has wonderful cafes, restaurants and bars and the largest fish markets in the Southern Hemisphere - it's a village worth celebrating," said Lord Mayor Clover Moore MP. "I look forward to enjoying an afternoon by the water at Pirrama Park, where growers and winemakers from the Mudgee region will show off some of their best food and wine." Full details of the program, how to book a lunch or dinner, and how to enter the Pyrmont Art Prize can be found at www.pyrmontfestival.com.